Growth is a complementary colour to decay. If fallen twigs could utter last words, they would be thought bubbles of coloured resin. If the skeletal remains of the hunted and the farmed were allowed to decompose in polluted atmospheres, they would contort in geometric convulsions. Jason Waterhouse wields transformative powers over his chosen objects, often stretching, bending and extending their forms; or transferring and exchanging materiality or scale. For this suite of sculptures he has opted for a collaged approach expressed through a meticulous hybridisation. Small branches ooze fabricated gloops of industrial materials in bright colours. Bones transition from organic forms to mathematically modelled polymetric protrusions. And best of all, cross-species inter-splicing threatens to rip holes in the space-time continuum. The bones don’t tell is the series of skeletal works, dominated by a large sculpture poised on the floor. A pair of antlers act as legs to a faceted cranial extension that becomes bodily and threatens to overwhelm not only its support, but the surrounding space. The skull has morphed so exquisitely into this form that it’s impossible to know where the head leaves off and the boney-extension begins. That tension between its origin and its present state keeps it alive beyond the initial impressive nature of its well crafted construction. Slipping between mutation, mutilation and transfiguration it is alive even when made of the fabric of death. The use of polyester resins for the fabricated elements hybridised with the organic is a powerful material choice. Produced from petro-chemicals the pairing of this substance with the pre-fossilised materials of sticks and bones creates a loop between the organic origin of the culturally crafted sculptural components and the biologically crafted ones. Where they have been coloured and, as a result, evoke floral elements on the branches, notions of our human desire to extract the beauty from nature for our own pleasure throw up a multitude of feelings and conundrums. Perhaps strongest amongst this series is the black version, where the oozing resin is pooling inside the branch and appears like a tumour. 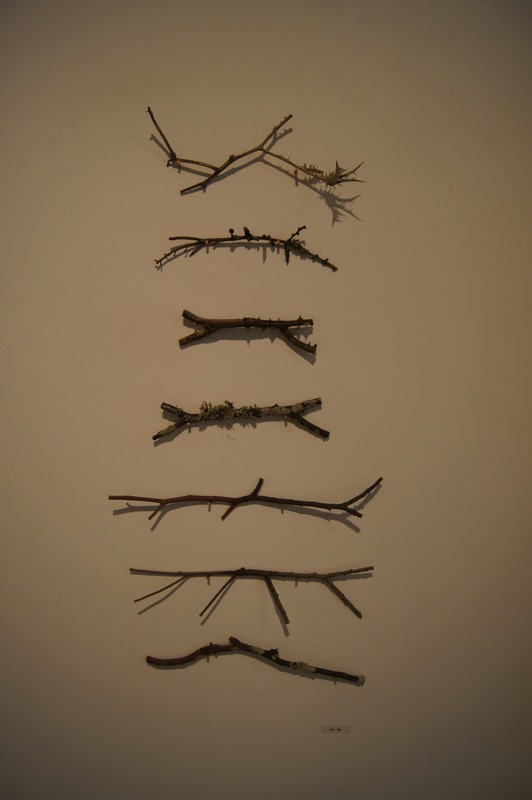 The Graft series of sculptures hybridises twigs of native species with introduced species. Subtle but loaded so heavily with inner force that they feel somehow a risk to the rules of quantum mechanics. Sometimes the simplest things can be the most intricately complex. Looking at these works, they could easily slip under the radar, such is the skill with which they are constructed. But that is where the first delight lies. Recognition of their construction leads you to ponder about all of nature’s construction. The synaptic firings only barely begin at this point. A blended amalgam of native and introduced materials? Why, that’s just me isn’t it? Wait, there’s a variety of different species in here. Is that like mixed cultural backgrounds? Well, there’s two nice little ideas right there, just tumbling out of a simple mashing together of detritus you find on the ground. But what’s this? The growth force of the twigs extends outwardly from the graft? But that means the central driving urge of life comes from, sort of, nowhere? And yet, somehow, from the combination of opposing directional forces?